Girls U13 friendly goes to the wire! The Beaconsfield fixture on Thursday went to the last ball before the result was known. 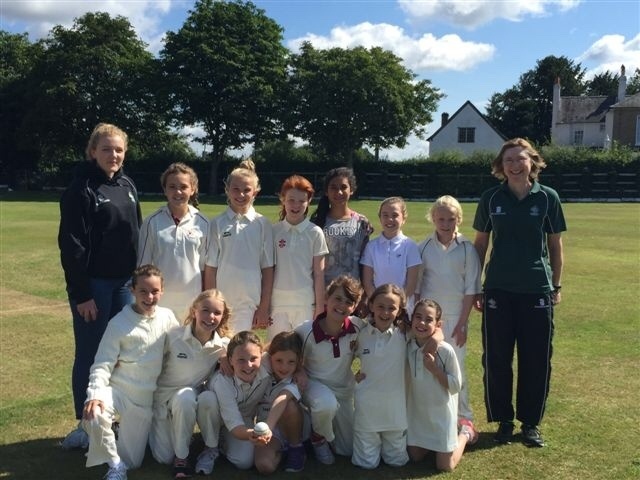 Daisy captained the team and quickly had to organise the batting line up, as Beaconsfield won the toss and put the Girls into bat. Poppy and Lucy opened the batting against some very accurate bowling. Poppy recovered from being bowled first ball to score a run with a lovely offside shot. Lucy defended expertly at the other end. Louisa and Evie were next in and called really well. Both got off the mark with good shots, particularly a pull shot by Evie. At this stage, we were battling against really accurate bowling and our score was hovering around the 200 mark. Youie and Lina (both on debut) joined next. Youie nearly hit a six over the wicket keeper and scored well in accumulating 13 runs. Lina had never played hard ball before and battled well. Captain Daisy and Xaynab then came into bat. They had the weakest bowlers and did well in only loosing one wicket but picking up about 20 extras in their 4 overs. Finally, Emily and Amelia went on the attack. Lots of runs, as they added 29 in 4 overs, with 19 off the bat. We finished on 248. Daisy decided to mix up the bowlers, with Amelia, Emily and Xaynab all taking wickets in their first over. Lucy and Poppy then backed up with a wicket each. Chenies bowling was very accurate with very few extras, but the score started to creep up. Enter Emily who had the honour of bowling the last over. Beaconsfield were on 244 at the start of the over. So the final over went; dot ball, dot ball, 2 runs, dot ball, dot ball.....2 to draw and the ball gets hit to Lina at mid wicket. Lina picks up the ball cleanly and throws a missile at the stumps running out their batsman. Queue high fives and the girls had deservedly won!! A great game. It was fantastic to see how the girls coped with the pressure of the close match. Daisy did well in charge and Youie was tidy behind the stumps, despite having a finger injury. Thanks to Julie for scoring and for everyone helping out. Special thanks to Tricia for the snacks.